Artist Signed Geometric Abstract Painting from Bali, "Geometric Beauty"
Says Balinese artist Harman, "Two circle shapes are the choice for one destination. If one fails, the other awaits." 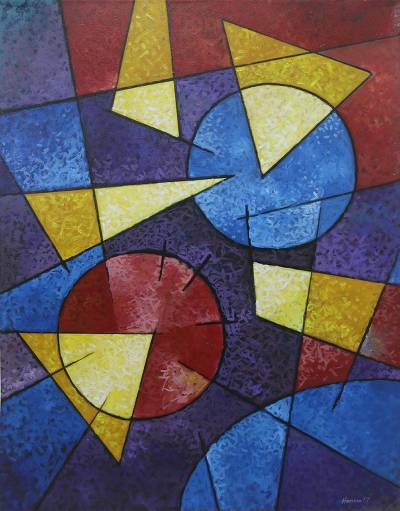 He paints this abstract composition, featuring two circles intersected by geometric shapes with various bold colors used to emphasize the intersections. A simulated texture gives this painting a striking aesthetic.